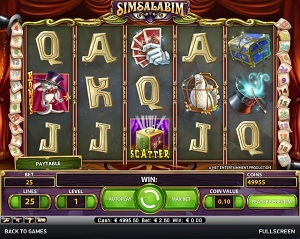 Simsalabim is a wonderful and amazing online video slot machine game from Net Entertainment that has been released in December 2011. This online video slot game has 5 reels and 25 pay lines. The theme of Simsalabim is based on the wonderful world of magic and illusions. Numerous online slot players typically love games that utilize the magical theme. Due to the fact that lucky charms and superstitious beliefs are closely linked together with gambling, this is hardly a surprise. In Simsalabim, you will experience the wonder of a magic show, complete with deep red curtains, a sly-looking magician, and lots and lots of rabbits from his magic hat! The only difference in this game is that his magic tricks and illusions can get you real money and the impressive wins! As always, when it comes to any of their slots games, Net Entertainment allows interested slot players to play instantly without requiring them to download anything. If you loved to watch magic shows when you were a child, or you are fascinated with how the magicians do their magic acts, then you will surely have a grand time playing this slot game! Participate in the hypnosis act of the magician and find as many rabbits in hats as you can in this magic-filled slots game which offers a maximum coin jackpot of 75,000, a maximum cash jackpot of $75,000, Free Spins that triple all winning combinations, a Bonus Feature game that challenges you to find all the rabbits hidden in hats, wild symbols, scatter wins (2 to 5 Scatters will pay them up to an incredible 200x their bet! ), and last but not least, a high 97.5% payout ratio! What most online slot players find alluring about Net Entertainment is that they offer fun graphics and entertainingly happy sounds, which make online slots more fun and enjoyable to spend time with. Simsalabim online slots will take you to a very brilliant magic show that not only entertains you, but also you can win excellent prizes at the same time! In the main game, the background setting of the reels is of a solid color, but just outside of the reels, you will see a setting of what seems like a magic show stage, complete with deep red curtains, long green snakes, magic cards and magician hats. In the bonus game, the background setting would still be the magic show stage (with 12 magician hats to choose from), minus the reels. The symbols are strikingly created in 3D animation. This online slot game is designed for long hours of playing and it is guaranteed not to hurt your eyes. The overall graphic design of Simsalabim displays colors such as green, blue, red, purple, orange, yellow, white, pink and brown. The constant background sound you will hear while you are playing Simsalabim is the incessant chatter of the audience (of the magic show). Different and short celebratory music is programmed when you hit certain winning combinations. The card deck symbols that are available in the Simsalabim online slot game are J, Q, K, and Ace. The regular symbols you will see also in this slot game are the Magician’s Hat, Caged Dove, Locked Trunk, and Magic Cards. The Wild Symbol is the Illusionist. It acts as a substitute for all other symbols to help you complete winning combinations, with the exception of the scatter symbols. In Simsalabim, there are 2 Scatter Symbols – the Magic Box and the Rabbit Bonus scatter symbols. Scatter symbols mean that they do not need to appear in a line (on an enabled pay line) for you to win. • The Magic Box scatter symbol can be scattered anywhere on the 5 reels for you to complete winning combinations, as long as there are 2 or more Magic Box scatter symbols that appear. Your winnings are calculated by multiplying the Magic Box scatter symbol combination payout (shown in the Paytable) by the total number of coins you’ve bet. If you hit 3 or more Magic Box scatter symbols, you will activate the Free Spin bonus game. • The Rabbit Bonus scatter symbol can be scattered anywhere on the reels, as long as you get 3 or more of these scatter symbols to appear in consecutive order and on an active pay line. If you hit 3 or more Rabbit Bonus scatter symbols, you will activate the Simsalabim Bonus Feature game (that takes you to a room where you must find rabbits hidden inside many hats). Keep in mind that the Rabbit Bonus Scatter symbols do not give out any winnings; however, it lets you enter the Simsalabim Bonus Feature game. Do take note that if you get a scatter win and a regular win, you will be paid out for both of them, because the Magic Box scatter symbol is not needed to appear on an enabled pay line to win. Scatter rewards are entirely independent from pay line awards and they are added to the pay line win. Simsalabim Free Spin Bonus Feature Game – You can win up to 30 Free Spins when you hit 3 or more Magic Box scatter symbols that can be found anywhere on the 5 reels! If you manage to get 3 Magic Box scatter symbols, you will be awarded 10 Free Spins; if you get 4, then you will be awarded 20 Free Spins; and if you get 5, you will be awarded 30 Free Spins! All of the winning combinations you complete during the Free Spin Bonus Feature games are tripled (multiplier x3)! When you get another 3 or more Magic Box scatter symbols while still playing in the Free Spins Bonus Feature game, you will be rewarded another set of 10, 20, or 30 Free Spins! The extra Free Spins you will win are then included to the remaining amount of Free Spins. You can win an infinite amount of extra Free Spins during the Free Spin Bonus Feature game. The unique thing that all slots players loved about the Simsalabim Free Spin Bonus Feature game is that they can also activate the Simsalabim Bonus Feature game; however, do take note that the bonus prize winnings are not multiplied by the Free Spin multiplier value. To activate the Simsalabim Bonus Feature game, you must have the Rabbit Bonus scatter symbol to appear in consecutive order, and on an enabled pay line. Please take note that the Rabbit Bonus scatter symbols do not give out any winnings; however, they let you enter the Simsalabim Bonus Feature game. The objective of the Simsalabim Bonus Feature game is that you click on the Magic Hats and find hidden rabbits that give you coins as your bonus prize. The Simsalabim Bonus Feature game will end only when you click on a Magic Hat that turns out to be empty. The more you bet in the regular Simsalabim online slot game, the higher your winnings will be in the Simsalabim Bonus Feature game. When the Simsalabim Bonus Feature game is over, you are then taken back to the main Jack Simsalabim online video slot game, and your winnings from the bonus feature game are included to your total balance. Simsalabim has 5 reels where you may bet on as many as 25 pay lines. The minimum bet is 0.01 and the maximum bet is 1.00 per line. You can wager from 1 up to 10 coins per bet line. Playing online video slot machine games is absolutely much more fun and exciting when it has an Autoplay function. You can play Simsalabim automatically by simply clicking on the Autoplay button located on the lower left side of the game screen, or you can click on the Autoplay button located just beside the Spin button (left side as well). You can set the number of spins by clicking on any numbered button, from 10 to 1000, and after selecting the number you want, click Start and the game will automatically spin for you. If you want a slightly more complex Autoplay setup, you can click on the Advanced Settings button and Stop Autoplay: on any win, if Free Spins is won, if Bonus game is won, if a single win exceeds a certain amount, or if your cash increases/decreases by a certain amount you have specified. When you are done with your preferred Advanced Settings, just click on the Start button and the game will automatically play for you!